Grass seed germination can be tricky for a number of reasons. When we plant our grass seeds, anticipation sets in and have us on pins & needles. 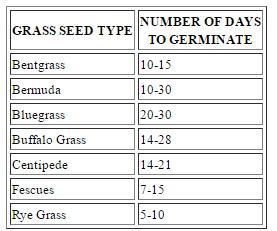 There are a lot of factors that will help out with that will help out with the grass seed germination process after you have planted them. We will cover a few things to help your seedlings survive the growing process here in this post. 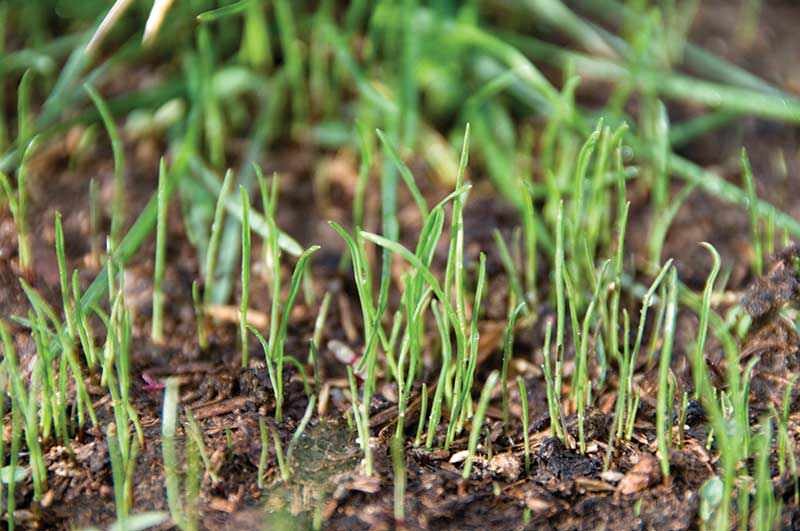 What Is Grass Seed Germination? Germination is the process in which a plant grows from a seed generally breaking through the shell or hull of the seed. In order for it to successfully grow, it needs sufficient moisture to start sprouting. This growth is also depending on the soil temperature they are planted in. The variety of the seed dictates the temperature that is needed. The hull, which is a hard outer casing, may delay the germination process until the conditions are favorable. 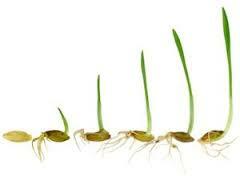 As soon as germination starts the environment can affect whether the seed or sprout will survive or not. This is what could put us on edge to whether they will grow successfully. In order for a seed to germinate it needs moisture at all times. Too little and the seed can dry out. Too Much and then it can rot out. Either way, you are stuck with a dead seed. Soil temperature affects the germination process as well. We spoke in the previous post on how cool & warm season grasses react differently when it comes to the climate. Cool season grasses need a minimum range of 45 to 65 degrees while the warm season grasses require a minimum of 55 to 65 degrees. The soil temperature is affected by moisture evaporating from the surface because it presents a cooling effect. So the soil actually warms slower than the temperature outside. 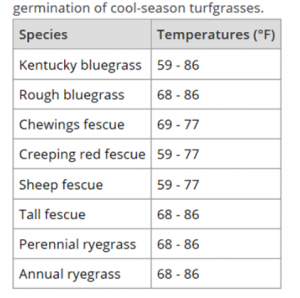 The chart represents outside temperatures for cool season grasses. You can monitor this with soil thermometer to help you keep a handle on it. For a reliable thermometer that is inexpensive, you might want to check into the Rapitest Soil Thermometer. It can help you a great deal in assisting the germination process. The last two ingredients are oxygen & light. When the sprout does break through the seed, oxygen is needed for it to grow. This is why you don’t want to over water because it will result in less oxygen. Compacted soil is a culprit in this as well. We all know how important photosynthesis is for plant life. This is why the light is needed because it actually creates a food source for the plant. So we must make sure the seeds are not buried so deep the sprouts can’t break through. Once you determine the proper time to plant your seeds, remember to put some compost down lightly over the seeds for added protection. Use the back end of a rake to mix the seed with the soil stroking it lightly. This will help the seeds to get the moisture it needs as well as assist them from running off during watering. Make sure you don’t plant around the time you have used chemicals such as weed killer, fungicides or pre-emergents. The product label on the seeds should help you determine the length of time you should allow before planting if you used any of these chemicals. Lastly but very important is to keep kids and pets out of the area you laid seed. This will definitely hurt the germination process if it is constantly trampled on. As far as birds and other animals go, do the best you can because they like to feast on the seedlings. This is just a natural thing that we can’t control. Below is a chart to give you an idea of how many days you should prepare yourself for before you will see any results. The grass seed germination process is one that will be a success and sometimes not. It depends on how well we do our part in assisting the process. Make sure you water correctly which is about 5 to 10 minutes twice a day to ensure the moisture is there. Also, make sure to use compost to help protect the seeds and to capture the moisture. Always keep anything away from the planted area that will disrupt it. After doing all that was mentioned your chances of producing a nice lawn will be favorable. Thank you for dropping in and I hope this post will help someone out in their lawn care ventures. Thank you. I hope that it will help you out if you ever decide to plant grass seed. I didn’t know that Bermuda could take up to 30 days, I always thought if it wasn’t up in 2 weeks you needed to reseed. I bet I’ve reseeded in the past when I just needed more patience. I’ve got to seed a part of the yard some raccoons dug up over the winter. That is why I make these post. A lot of times if someone knew what was going on, they could do wonders in their lawn. Also, make sure you are doing the proper watering as well. Good luck on your next overseed. Thanks Ronnie for a very informative article. I really like the way you covered the topic. I have recently put in a borehole in our backyard and as we now have water, I was thinking of putting in a lawn in one section of our plot. This information was exactly what I was looking for. Thanks. Very good. I always am pleased when my post is able to help someone. Make sure you look at this link prior to planting because it will be of great help to you as well. Thanks for visiting. Your web page has been very helpful to me. I have a second home, a cottage really, that pretty much every year I find myself spreading grass seed in specific areas of the lawn. Not sure why, but after every winter season the grass just does not come back as thick and lush as it was. I local co-op that sells bulk grass seed told me to try ‘creeping red fescue’ in my problem areas. So today I bought the seed, and tomorrow I will spread it. I did some research online to see what I could do to ensure my new grass seed takes hold and came across your sight. In past years it seemed my new grass was not coming up very well. I think I was watering it way too much. I am going to follow your suggestions above and see how things turn out. I hope I can help you out. I will tell you this, creeping red fescue is a cool season grass. Make sure you are in a cool region for this seed. It is drought resistant so it is a low maintenance grass. I wonder if where you are having the thinning problem is in a shaded area? If so, you need a drought resistant grass there. Good luck on your lawn. I hope I am able to assist you. Thank you so much for your useful and clear information. I really appreciated the helpful charts you included about soil temperature and germination times. We have a couple of grass-challenged areas in our yard. So this article is a huge help us. Maybe this year we will be successful at starting new grass! I do hope so. Remember that a lot of times it has to do with watering, cutting, type of seed and shaded areas that will give you the blues. If you have anything you are not sure of, refer to the lawn care tips on this site. I might have a post in there that may be focused on a problem you are having. Glad to have found this post, my dog damaged a spot in the lawn and I hope to reseed the area. I didn’t realize I would need to water the area twice per day, also will need to find a way to keep my dog out during the process, any suggestions, maybe chicken wire around the area? I think it would be best if you keep him or her out of the area as much as possible. A dog usually likes to go to that same area for some reason. You would have to use quite a fenced area unless the dog is really small. I think you would do better just insuring yourself he does not have access to the area. Good luck regrowing. It can be done. This was so, so helpful! I’m always having issues getting seeds to germinate properly. Usually I think it boils down to temperature constraints of different grasses. I think it’s tough to figure out just what I need in a really hot environment. Sometimes I think of giving up on the lawn and going with the old school desert rock or concrete landscape. However, I think after reading this I can make it happen! This fall I will get some solid pictures of the results and shoot them your way. Thanks for the informative, helpful article. It’s hard to find quality content online these days! NP. 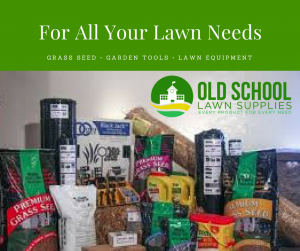 You can go to your local home & garden center and inquire about what is the local grass for your region and they will be able to get you on the right track. Just remember when you plant that moisture is the important thing but not to over water. Good luck.